„Another Fall From Grace“ wurde von Wayne Hussey und Tim Palmer produziert und featured guest backing vocals von Gary Numan, Martin Gore (Depeche Mode), Ville Valo (HIM), Julianne Regan (All About Eve) & Evi Vine. “For me, this new Mission album is the long lost missing link between the Sisters Of Mercy’s First & Last & Always and The Mission’s God’s Own Medicine, both albums of course that I was heavily involved in making. I set out this time with the intention of making an album that sounds like 1985. The fact that I feel this has largely been achieved is down to my renewed love for the jingle jangle shimmer of the electric 12 string guitar which featured heavily on those two previously mentioned albums and now the new Mission album. Am 2. 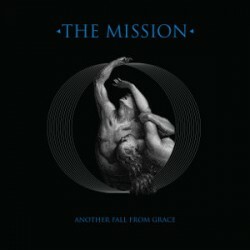 September veröffentlichen The Mission die ‚Met-Amor-Physis‘, die erste Single aus dem kommenden Album. Co-Produziert von Tim Palmer und Wayne Hussey, ‚Met-Amor-Phosis‘ featured backing vocals von HIM-Frontmann Ville Valo. ‚Met-Amor-Phosis‘ ist aus einer Fahrt auf einer Küstenstraße von Los Angeles nach San Francisco entstanden, erklärt Wayne – “Bowie had just died and whilst the first verse is mostly autobiographical having also recently read Kafka’s novel of the same title the second verse is certainly flavoured by Bowie’s passing’’.